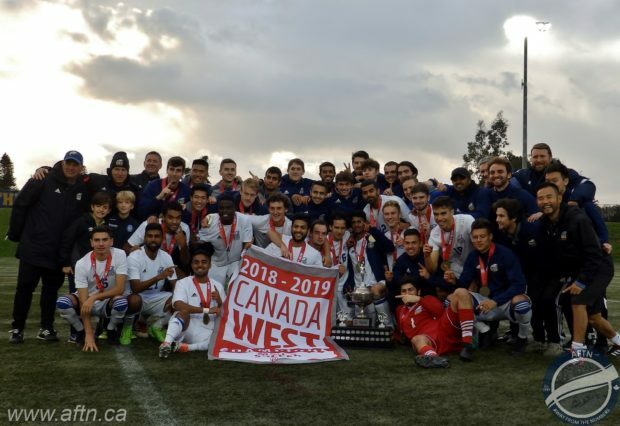 UBC Thunderbirds got the ideal preparation for this year’s U Sports nationals at Thunderbird Stadium on Sunday afternoon, lifting their 19th Canada West championship trophy with a 2-0 win over Trinity Western Spartans. A fourth minute goal from Victory Shumbusho set the Thunderbirds on their way, before Connor Guilherme was credited with a controversial second on the half hour mark. Trinity Western fought hard to get back into the match, but UBC seemed a class above them, and they were only able to force just one save from Thunderbirds goalkeeper Jason Roberts the whole afternoon. That second UBC goal will certainly stick in the throat of the Spartans. As the ball bounced around in the box from a corner, Guilherme got his head on it, directing it goalbound. A deflection from Spartan Cody Fransen sent the ball crashing off the bar, then seemingly headed off the goalline, but the linesman’s flag was quickly up to indicate it had crossed the line, with the video proving inconclusive. Disappointing for Trinity Western head coach Mike Shearon, but he wasn’t using that as any excuse for his side’s defeat. “I thought we played well at the beginning,” Shearon added. “Then we gave up the goal that was poor on our part I thought, but well taken by them. The second one kind of hindered us a bit, and then our belief went away a little bit… I’m not going to criticise the referees, but I don’t think it went in. The victory gave UBC their second straight Canada West championship, and with 12 goals and three clean sheets from their three playoff matches, they’re heading into hosting next week’s U Sports nationals in excellent goalscoring and defensive form, and full of confidence. “This is a very difficult conference to win, so I’m super proud of our group,” Mosher enthused. “Certainly we want to win the big one, but this is a very important championship to win. It’s something that you’re always going to have and also in the big picture, it puts us hopefully in a good spot with the draw. Both UBC and Trinity Western will now head into this week’s nationals looking to bring a U Sports title back to BC for the first time since the Thunderbirds won their 13th title in 2013. The action gets underway on Thursday with the 8th seeded Trinity Western Spartans taking on number one seeds York Lions at Thunderbird stadium at 11am. Third seeded UBC will kick off their quest with a tough one against Carleton Ravens at 6.30pm. As the broadcasting team for the Thunderbirds all season long, AFTN are delighted to be bringing you commentary on a number of the matches over the four days and we’ll have a full build up to the tournament here on the site all week.